Chili Bowl Diary Day 1. The anticipation is very high. Tonight we start the legendary drive for the Golden Driller in Tulsa. The Race of Champions is tonight as well as the first night's qualifying card. The Chili Bowl works on passing points to line up the Qualifier races which determine where you start in the A or B Main. The passing points are earned in the heat races. They work a little different from what we are use to as the Outlaws do not use passing points and points are only awarded in A Main. It’s not a difficult system to understand but it's different - 1.5 points per position advanced in the heat. The points are used to line up the Qualifiers as well. Other than that if you win the heat you start well in the qualifiers. Basically the top four transfer to the fast qualifiers. There are four qualifier races after the C Mains. which there are two of those heat competitions. Top four transfer to the two B Mains. The top four of each B Main transfer to the back of the A Main. The top 16 from the qualifiers lock into the A Main. The transfers from the B Main line up first with the first B winner, second B winner next in the first B Main, second in the second B Main and etc. for the rest of the eight to form a field of 24. The A Main is 25 laps in length. The top three lock themselves in for Saturday’s big show. Everyone else runs alphabet soup. Now that we have that in the notes, the racing itself was awesome. It was an incredible night and a huge challenge to the drivers with a track that was for the most part, throughout the evening, a single groove race surface. It was greasy, slick and took "everything in the tool box to survive it," as Tony Stewart would comment later. But the talents, iron wills and drive that was displayed by drivers of every genre of racing was an amazing sight. There is no bigger thrill than to walk up and shake hands with P.J. Jones or exchange pleasantries with Sammy Swindell. There is no greater honor than to shake hands with Levi Jones or Dave Darland and of course the man nicknamed "Smoke." There was nothing sweeter than watching little people steal the hearts of their heroes with a smile, a shuffle and then a lunging hug. The Chili Bowl is one of the most prestigious dirt races in the world. This year we have drivers from Finland, New Zealand, Australia, Great Britain, Canada and of course the United States. There are fans from all 50 states and four countries. There are Indy Car, Non-Wing Sprint Car, Winged Sprint Car, Silver Crown, USAC Midget, NASCAR Sprint Cup Series, Nationwide Series and Camping World Truck Series drivers. The Chili Bowl is so important that there are 21 drivers in the field who have never driven in the event before or piloted a Midget previously. The Chili Bowl is a very big deal. The Chili Bowl though makes for a long week for families, fans and media people like me. Saturday is the long day for the drivers with 16 hours of racing. During this time, the rest of us just sit numb, robotic and go through the motions. Tonight, the stand out race was the Annual Race of Champions. A Swindell, either Kevin or Sammy, has won the race for the last three years. Tonight it was Kevin. It seemed that Sammy might have the race in his pocket starting on the pole; however, the man to his outside was no stranger to the Chili Bowl or racing against Sammy Swindell and J. J. Yeley was determined to make it a race. Yeley would get the jump on Sammy Swindell in the first corner for the lead and pull to a large advantage that he would hold until Kevin Swindell cleared the traffic as he took second place. Kevin Swindell ran J. J. Yeley down from a half a straight a way back in less than two laps and took the lead with five to go. He would never look back and took the checkered flag. Three-time NASCAR Sprint Cup champion Tony Stewart would pull off the track after six laps and running around in the back of the pack. "We only had one car so if we got in any kind of altercation we were going to be in a bad situation so we elected to use the race of champions to feel out what we had. We ran five or six laps and then pulled in to get ready for the A Main. I feel good about our car, we have the most to gain of anyone up here." 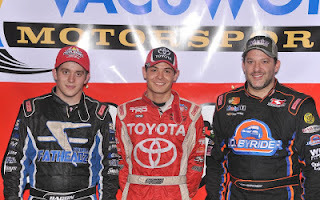 The A Main was a hard fought affair that would go to one of motorsports most promising young stars. A throw back of sorts that is often compared to Tony Stewart, Kyle Larson can drive anything. He wow’d the crowd with his trademark burnout sans steering wheel which he held out the window for the crowd to see. “I knew it was going to get to the top within a few laps,” commented Larson when asked about Bacon taking the lead away early on. “I really was focusing on finishing in the top three and wasn’t really too worried about him [Brady Bacon] getting by me but he was setting such a fast pace and I didn’t know how fast the other guys were behind me." In the end Larson would hold off a charging Brady Bacon to win and Stewart would come home third to lock into the A Main on Saturday. Casey Shuman held on for a fourth place finish with Chris Windom making up the top five. Broken Arrow, Oklahoma’s Jonathan Beason, advanced from his tenth starting spot to finish sixth. Despite dropping a valve in the final laps, Phoenix, Arizona’s R.J. Johnson held on for seventh with Finland’s Markus Niemela crossing the stripe eighth. Shane Cottle and Kevin Ramey rounded out the top ten. The two C-Feature wins went to Darren Kingston and Kurt Mayhew with four A-Feature Qualifiers taken by Markus Niemela, Brady Bacon, Kevin Ramey and Shane Cottle. The Chili Bowl is a melting pot of the world’s greatest drivers. If you were to look at the entry list and the home series of the entrants, you would hear the famous "Green Frog" singing the one of these things doesn’t belong song. But don’t listen to the frog because in this case he is wrong. No matter how different the series they normally compete in might be, everyone belongs at the Chili Bowl.